15.11.2016 Strasbourg – The Council of Europe Action Plan for Georgia (2016-2019) was discussed during the meetings held at the Council of Europe in the frames of the visit of Georgian First Deputy Foreign Minister David Zalkaliani to Strasbourg. 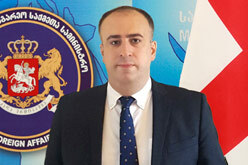 The document was elaborated as a result of consultations between the Georgian Government institutions and the Council of Europe. The document covers the projects carried out by the Council of Europe in Georgia, the aim of which is to co-operate with Georgia in the spheres of human rights protection, strengthening democracy and the rule of law. Georgian First Deputy Foreign Minister David Zalkaliani and Deputy Secretary General of the Council of Europe Gabriella Battaini-Dragoni discussed the process of implementation of the projects under the Action Plan. The Deputy Secretary General underlined the progress Georgia has achieved in carrying out the democratic reforms and positively assessed the Parliamentary Elections held in Georgia. Representatives of the Georgian Government institutions and the Council of Europe project coordinators discussed in detail the projects and expressed the hope that the Council of Europe member countries will support the implementation of the projects. In the frames of the visit, David Zalkaliani also met the delegations of the CoE member states and the organisation’s high-ranking officials. The participants of the meeting were also provided with the updated information on the humanitarian situation in Georgia’s occupied territories.